With Malayalam Industry going through one of its best phases ever and in continuation of the 2016 magic, 2017 also was a great year for the industry, producing great string on movies both commercially and critically well acclaimed. Right from the first movie of the year Munthirivallikal Thallirkumbol to the last movies that released during the Christmas-New year vacations huge amount of business were created which included two first day records too. But who was the real star of 2017? if it was Malayalam’s own Superstar of all times Mohanlal who made an astonishing business of nearly 200 crores ( as per production houses ) in 2016 then its Megastar Mammootty who made another astonishing business of nearly 122 crores in 2017. 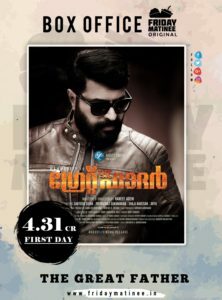 The Great Father, Mammootty’s first movie to be released in 2017,which came after 6 months since his last release, made at a budget of 5.75 crores broke all existing day one records and went past 60 crores worldwide business as per the closes close to August Cinemas and was a thundering blockbuster of 2017 in Kerala as well as GCC. While his next two releases Puthanpannam which was released during the #TGFWave and Pullikaaran Staara which was released as an Onam release didn’t fair well as expected yet made a business of nearly 22 crores in its worldwide run. His last release of the year Masterpiece directed by Ajai Vasudev broke the day one records entering magical 5 crore club playing a record number of shows made a business of over 40 crores, claims Royal Cinemas and Makers of the film. 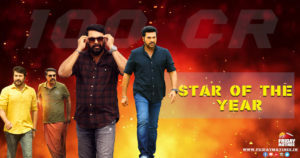 Thus, Megastar Mammootty movies made a business of over 122 crores in its worldwide business and thus became the only actor to make a business of over 100 crores in 2017.While The Great Father ended up as a Blockbuster and biggest hit of Mammootty’s career, Puthanpannam was a flop and Pullikaaran Staraa was a break-even venture. His year-end release Masterpiece which is still running in theatres is a Superhit and profitable venture for the makers, even breaking the opening day records. Note: *Business figures includes worldwide gross, Satellite rights, Audio and Video Rights, ROI and GCC rights.